Bryce Bennett qualified for the 2018 Olymics after his performance on Jan. 12 on the slopes of Wengen, Switzerland. Bryce Bennett first stepped into a pair of skis at the age of 2, and after more than two decades on the snow, that toddler has grown into one of the country’s top skiers. At last week’s World Cup alpine combined race, Bennett put together a standout performance on the slopes of Wengen, Switzerland, claiming a top-10 finish, and in doing so, fulfilled a lifelong goal by stamping his ticket to Pyeongchang, South Korea as a member of Team USA. It would take some time before Bennett heard the news that he’d made the Olympic squad, a fact the Squaw Valley skier didn’t learn until he logged onto his social media account. “I actually saw it on Facebook,” Bennett said. With a consistent season of World Cup racing up until that point and four spots open on the U.S. roster, odds were Bennett would be named to the team eventually, so when the announcement came that his top-ten finish at Wengen had landed him a spot on the men’s alpine squad, Bennett wasn’t exactly overcome with emotion. His ninth-place finish at Wengen was the best by any American on the day, and matched the best result of his career in combined. The top-10 finish cemented his spot on the Olympic roster, according to a statement from Team USA. Bennett started the day by putting himself in great position. He ripped through the course for the seventh fastest downhill time at 1:45.09, which was 0.69 seconds off the leader and second fastest time by an American. 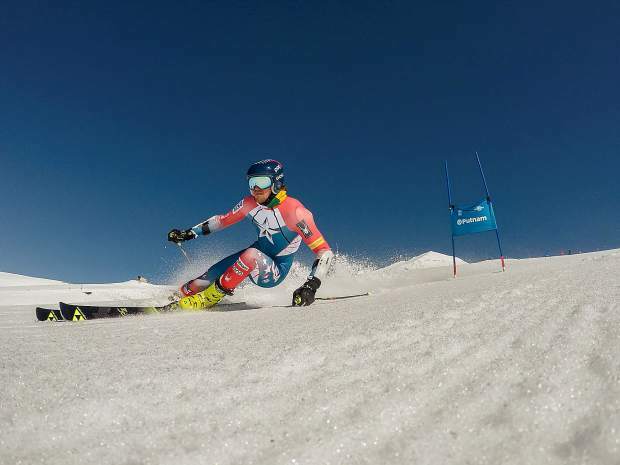 From there, he put together a solid slalom run to finish ninth overall to claim his spot on Team USA. He finished the combined event in Wengen with a total time of 2 minutes 36.74 seconds. France’s Victor Muffat-Jeandet won the race with a total time of 2:35.29. Bennett was born to ski. His father was a telemark racer, according to information from Team USA, and his mother worked at Alpine Meadows. As a youngster, Bennett joined the Squaw Valley Ski Team, where he first ran into coach Greg Jones. Due to his size, Jones said he didn’t have high aspirations for the rangy youngster’s alpine career, but Bennett, now 6 feet, 7 inches, soon proved his doubters wrong. “I’ve watched him evolve through all those years. It’s pretty weird because I never had huge expectations for him, because he’s such a big kid and skiers that size, don’t have huge success,” Jones said. As the seasons wore on, Bennett matured and went from being somewhat of a troublemaker to a role model for the younger skiers on Squaw’s team. Then in 2011 Bennett joined the U.S. Ski Team after a spring tryout. He went on to win the U.S. downhill title at the U.S. Ski Team Speed Center at Copper Mountain in 2013. He also had his first World Cup race that year. Bennett continued to grow as a skier and climbed the rankings over the next few seasons, and at the end of 2015, he posted his best ever World Cup result, taking sixth place in downhill at Val Gardena, Italy. This past summer Bennett picked up his first A Team nomination from the U.S. Ski Team, which provided him additional funding and support during the World Cup season. Bennett has made good on that nomination, becoming one of the country’s most consistent alpine skiers. He has finished in the top 20 in each of his past five World Cup events, and trails only Ted Ligety for the most overall points by an American this season. Bennett is sitting at a career-high 114 World Cup points for 43rd place. Ligety has 128 points for 41st place. Austrian Marcel Hirscher is the leader with 974 points. After qualifying for the US Olympic team on Jan. 12 at Wengen, Bennett continued with racing the following day, and posted the Americans’ fastest time in downhill with a total time of 2:28.74 for a 17th-place finish. Switzerland’s Beat Feuz won the race with a combined time of 2:26.50. Bennett said he will continue racing on the World Cup tour up until the Olympics, and likely won’t return to the country until after the games. Next month, Bennett will head to South Korea to compete in his first Olympic games. He said the U.S. ski team isn’t staying in the Olympic Village during the games, but other than that, he plans on taking in the full Olympic experience, starting with Opening Ceremonies on Feb. 9. Bennett and the rest of the U.S. skiers had a chance to check out the course in South Korea two years ago during a test event. He said the course is fairly simple compared to those on the World Cup circuit, and plays into his strengths as a skier. “It’s a pretty mellow hill. There’s some jumps and built-in technical sections, but for the most part it’s pretty mellow. You need some fast skis and you’ve got to tuck a lot. Aerodynamics are pretty important for me and keeping my large frame out of the way,” Bennett said. Jones echoed those thoughts, and said he liked Bennett’s chances on the course in South Korea. “I talked to Travis (Ganong) and Bryce about it a little bit, but it sounds like it’s something you can go at fearlessly, and that favors Bryce,” Jones said. The Olympics not only provide the brightest stage for the sport, but without any season points or rankings to worry about, athletes are free to go all out in hopes of putting together a couple of runs to land in medal contention. While Bennett won’t likely return to the Truckee-Tahoe area until after the Olympics are completed, he did have one final message for the hometown crowd.